A few days ago I spotted a damselfly perching on a foxglove leaf, then it took off and came to rest on a nearby rose bush. 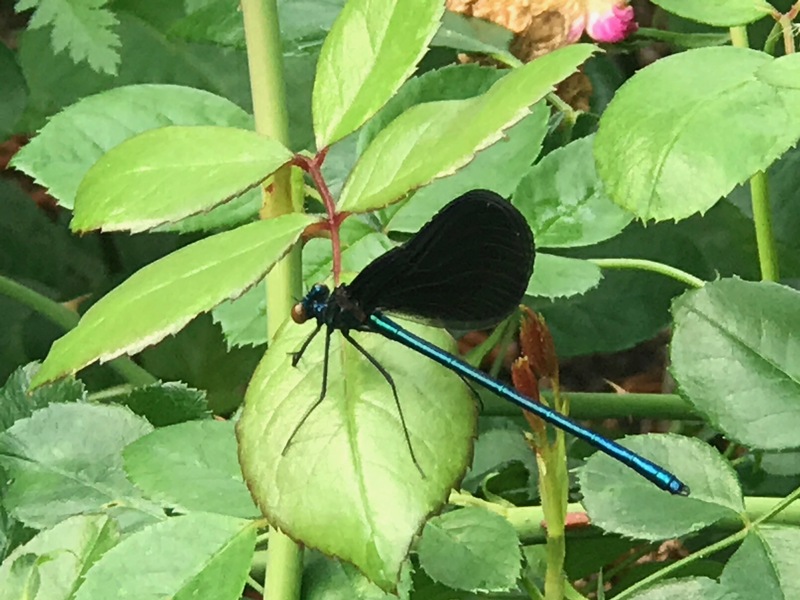 I did not recognize it but by typing in a few keywords “damselfly black wings aqua blue,” Google soon revealed this visitor to be Ebony Jewelwing (Calopteryx maculata). I used this information to create my first observation in iNaturalist, a “site and community for reporting personal observations of any plant or animal species in the world.” Pretty cool? Under a crowdsourcing model, community members help identify or confirm the identification provided. There are many scientific research projects that rely on this data, so the data is assessed for quality by the community. Because iNaturalist is primarily about observing wild organisms, when entering an observation the observer is asked to indicate whether the observed organism was captive/cultivated or wild/naturalized. Since this damselfly was seen in my garden setting, initially I chose captive/cultivated. With this designation the observation is marked as a “casual” observation. Scientists are not as interested in casual observations. But after rereading the help topic I edited the observation and marked it wild/naturalized. The distinction is that while the rose was where the gardener intended it to be, this lovely Ebony Jewelwing was where it wanted to be. Within a very short time after making this edit my damselfly observation was not only confirmed and assigned Research Grade status, it was also picked up and added to a project that is studying the location of migration routes of dragonflies. Exciting! It will take some time to learn all about iNaturalist, but I hope to take advantage of it as a learning resource and eventually contribute more observations and help with identifications. How about you? This entry was posted in garden and tagged Ebony Jewelwing (Calopteryx maculata), iNaturalist on May 16, 2017 by pbmgarden. Cathy, check out the link. You should be able to create a profile and use iNaturalist from anywhere around the world. It’s a global endeavor. I’m looking forward to photographing more insects in the garden, especially ones that are patient enough to sit still and pose! An excellent post! I’ve been meaning to participate in iNaturalist. So many people recommend it. Most of my citizen science reports/observations have gone to Learner.org, eBird, the Great Sunflower Project, and local sites. Citizen science is awesome. That damselfly is awesome–great capture and reporting! Thanks Beth. A couple of years ago I tried to get our neighborhood interested in doing a bird count and recording results in eBird–only 2 participants! Glad you reminded me about it though. Fascinating to learn how one thing led to another, based on your observation. So many garden mysteries might be solved in this way. Saw that some school project on iNaturalist led to observing insect unseen for 100 years. Sorry but can’t find the link right now. Never know what we might come upon. Very cool! Both the Jewelwing and the citizen science project. Thanks Jason. Wish I could find more time or find way to be more efficient. It would be fun to backfill iNaturalist with some offer photos. I read about this on Jason’s blog too; it seems a brilliant way of using people with intimate knowledge of their gardens and a resource from which you can learn more too. I wish the same thing existed here. I’ll have to check out Jason’s take on iNaturaist. We have a friend whose been active on the site for several years and I finally decided to try it. You can definitely use this same tool Christina through their website: iNaturalist.org –the endeavor is a global one, which makes it very interesting. The project to which my observation was added is based in Mexico. Oh, that’s good to know, I’ll check it out. Yes, I took a series of fuzzy shots before getting this one. If you have time to share what you find in your meadow Annette, the website is iNaturalist.org –the endeavor is a global one.